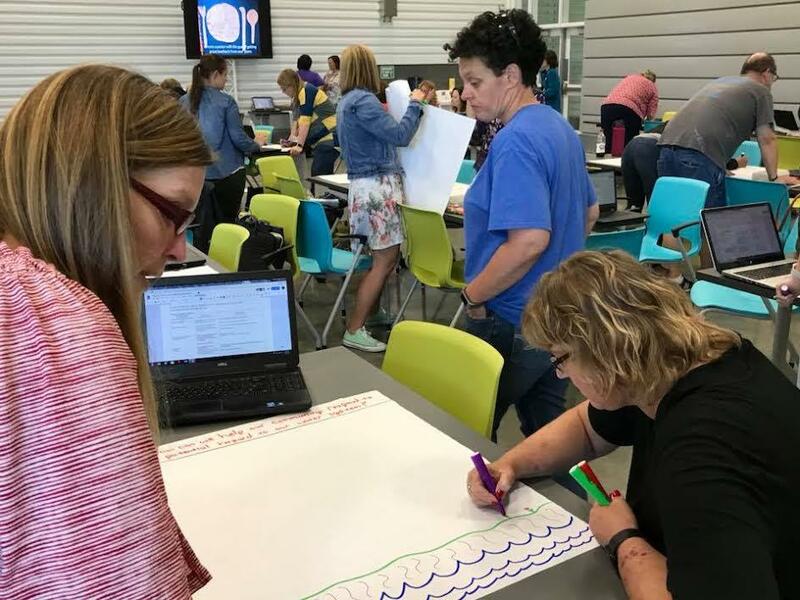 Teachers and administrators from across the Logan County School district met for three days of intensive project-based learning workshop recently at the new Career and Technical Center. Auburn School was represented by teachers Taylor Carter, Kim Cron, April Engler, Ashley Latham, Angela McColpin, and Tina Owens, assistant principal Sarah Hatton, and principal David Ward. 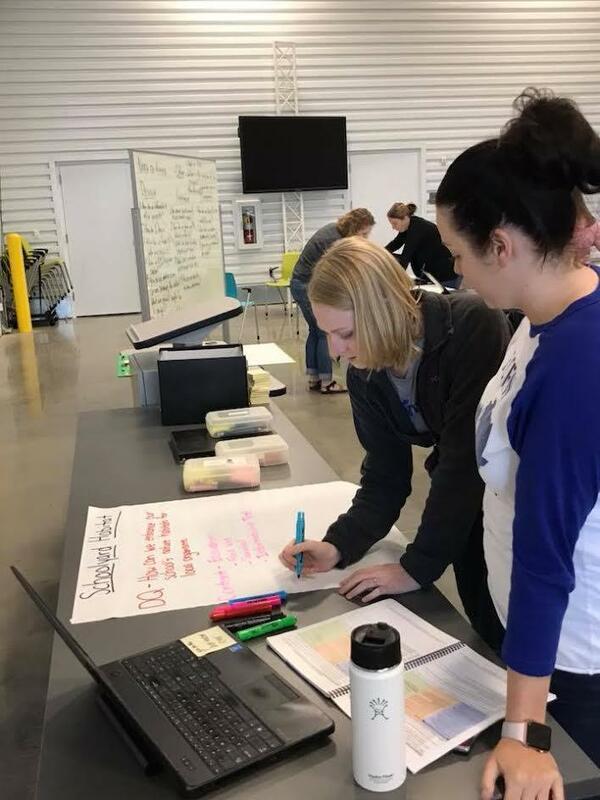 Led by Drew Perkins of TeachThought Professional Development, teams of teachers created, developed, and refined multi-disciplinary projects for the upcoming school year. Teachers also developed authentic assessment and management strategies for the learning as part of the workshop. Project-based learning (PBL) engages students over a period of time to solve a real-world problem or complex question. Students develop a public product or presentation for a real audience. Through the project, students develop the crucial critical thinking, creativity, and communication skills needed for 21st century learning. Fifth grade teachers Ashley Latham and Taylor Carter developed a science-based project to engage student learning about ecosystems and habitats. Students will determine a way to enhance Auburn School’s habitats for all local organisms by conducting research to determine the type of organisms that thrive on the school’s playground. Students will research to determine a problem based upon the question: How can you enhance your school’s nature habitats for all local organisms? The project requires students to research possible solution and design an action plan. This plan will include researching local organisms, observing local habitats, looking for problems and/or improvement, and creating a model/project to present to local stakeholders. Students will have the opportunity to bring their plan to life by creating their design to enhance our school's habitat. The seventh grade team of teachers, consisting of Angela McColpin, Tina Owens, April Engler, and Kimberly Cron, developed an interdisciplinary unit that will enhance students’ understanding of the logistics of clean water and how crucial it is to human survival. Based around the reading of Linda Sue Park’s novel, A Long Walk to Water, students will take their own walk to the Auburn City Park to collect water from the local creek. This water will then be tested to determine if it is potable, or safe for human consumption. Students will investigate and conduct data analysis around the guiding question How can we ensure that clean, safe water is available? Connections to history will be created as students discover why civilizations are centered around a clean water source. Furthermore, students will solve the problem of having contaminated water by learning to create their own filtration systems so they will be able to have clean water to drink. Students will present their projects during a literacy event sponsored by FRYSC during the second semester. Auburn School is excited about the new learning possibilities available through the development of project-based learning within our classrooms. Through this work, we hope to assist and encourage future teachers into exploring project based learning to expand student learning beyond the four walls of the school. If you are interested in learning more about project based-learning, you can explore multiple resources at www.gettingsmart.com and search Project Based Learning.